Part 2: Beginners guide to the PIC Microcontroller. I/O Ports - using microcontrollers to communicate with the 'real' world. A microcontroller is not much use if you can't control or measure real-world-signals and you do this using an I/O port. An I/O port is usually as wide as the CPU part of the microcontroller and for mid range PIC is 8 bits wide. In a any processor (or microcontroller) there is a data bus and address bus and the data bus defines the number of bits of data that can be transferred at any time; In the 12F,16F,18F series devices this is 8 bits at a time. It makes sense that the fastest way to get data into or out of the device is to use a port that has the same width - so ports on these devices have 8 bits. 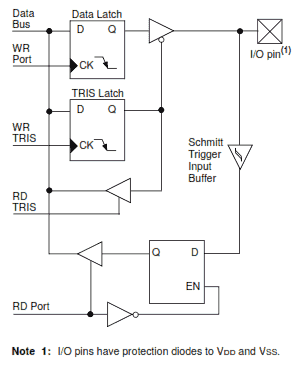 Note: Not all port pins have a schmitt trigger input - some have extra hardware and some have less - you have to read the specific datasheet. The top data latch stores the value you want to output to the pin while the second one down (the TRIS latch) stores the state of the ouput (either digital output or tristated) i.e. the TRIS bit controls the tirstate buffer (triangle and dot). When it is tristated digital information can come into this pin and be read by the RD port and from there into the processing unit. Other ports have more hardware supporting more functions such as interrupts, TTL buffers. Analogue functions are also multiplexed into some hardware port pins so the analogue signal can be routed into the ADC. Each port is usually labeled as PORT followed by a capital letter starting at A. So the first port is PORTA and the second is PORTB etc. Each port has a basic functionality that is the same whichever port you use and this is digital I/O. Each pin of the port corresponds to a pin on the microcontroller which you can set to either digital input or digital output. Any voltage below 0.8V is read as logic zero. any voltage above 2.0V is read as logic one. Note: This is for a 5V or 3V system (check the data sheet for exact levels when using other power supply voltages). Since devices have a small number of pins compared to the number of peripherals in the device each pin is usually multi functional. You can either use it in its basic digital I/O mode or you can use one of its shared functions. * PORTC bit 7 (RC7) - Digital I/O. * USART Rx - RS232 Receiver input. * DT - Data input: synchronous reception. So you have to decide what you want to use the pin function to be before you wire up the circuit! This internal peripheral lets you read an analogue input (as long as it is within the range of the microcontroller power supply) and not only that - it has a multiplexer that lets you read analogue voltages from different pins. Note: The exact pins that are allowed for reading analogue voltages are device specific so you need to read the data sheet to find out that information. One of the device I find amazing is the 8 pin 12F675 - it has a full 10bit adc built into it, multiplexed to four pins, so you can make it into a 3 channel volt meter (one pin is needed for communication out.. Or you can use the ADC to measure the output of an LM35 temperature sensor. This reads a value from ADC input zero - and that's all the code you need to know about! - no register setup - no data sheet - totally easy.